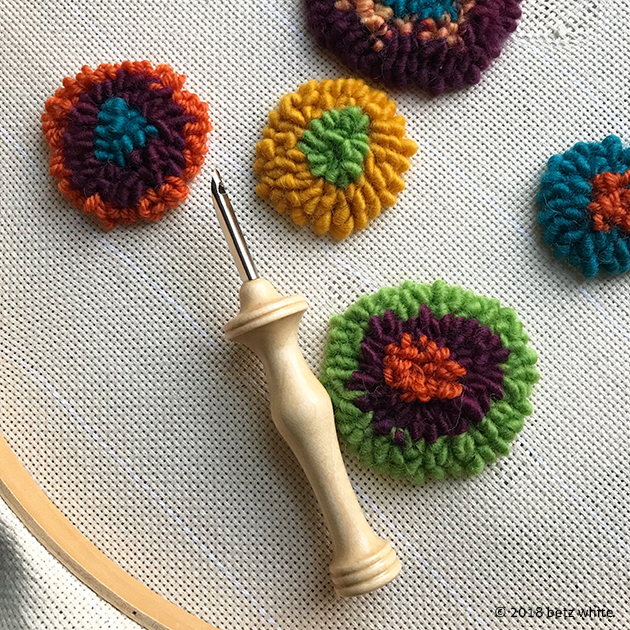 Have you tried punch needle yet? I’ve been wanting to try it for a long long time but I REALLY don’t need a new craft obsession, do I? No, no I don’t, but I tried it anyway! But I’ve been seeing some beautiful punch needle projects on Instagram and it just looks so darn fun! In fact, I posted a photo of my first attempt on Instagram and it’s gotten a lot of positive feedback, so I thought I would share it here as well. I got a regular size 9 punch needle from the Oxford Company for my birthday, as well as some monk’s cloth. The punch needles are a pointed metal tube with a turned wood handle. There are different sizes for various weights of yarn and loop heights. The monk’s cloth is a special fabric that is used because it’s structure helps hold the loops in place as you work. Typically one would also buy a frame to stretch the cloth onto, but I just used a large quilting hoop, about 14″ wide. Here you can see my first little practice blob, working from the “wrong” side of the piece. You literally punch the tool into the fabric, pull it up then punch it back down about 1/4″ away. that makes kind of a stitch on the side you can see, and 2 loops on the other side. You just keep punching up and down to fill in a shape. If you make a mistake or don’t like it, you can just pull on it to undo your loops. This is the right side of the piece. I used some roving style wool yarn, bulky size, that I had in my stash. 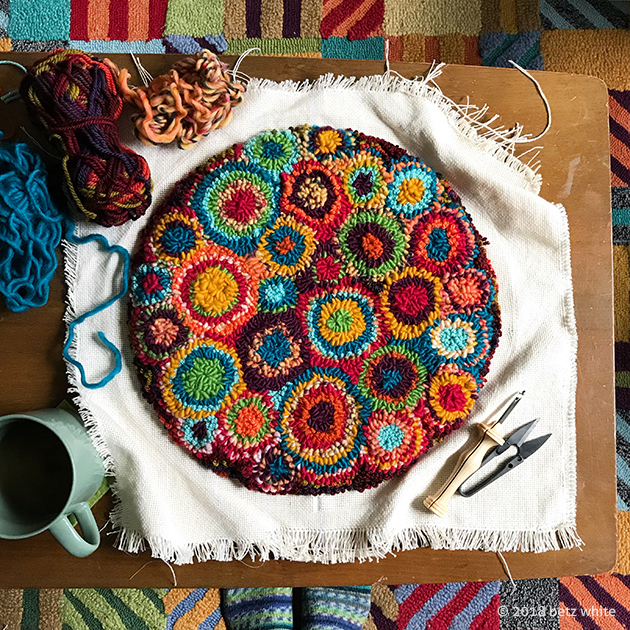 I worked in random circles and just kept changing yarn colors and adding concentric circles around the last color used. It wasn’t too hard to get the hang of, although in the future I’ll be getting a frame because I don’t think the hoop held the monk’s cloth tight enough. Round and round, punch punch punch! It really is fun and very addicting! As my circles ran into each other, I filled in the little spaces where needed. Then I punched around the perimeter until the whole hoop was filled in! 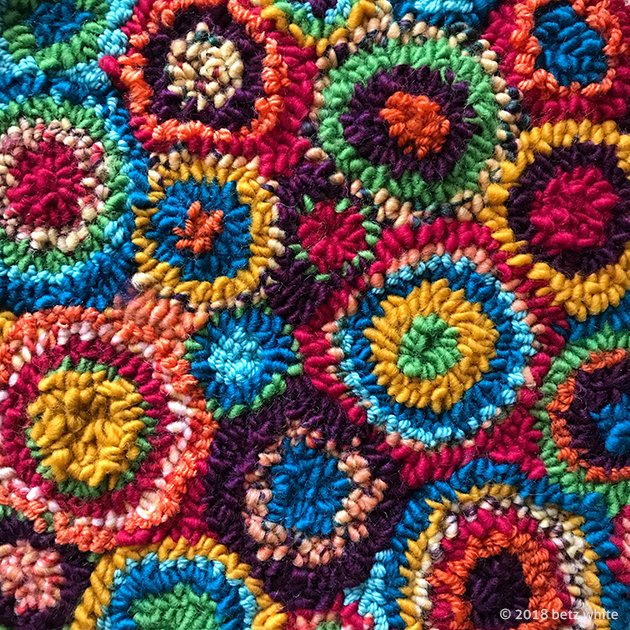 I thought that perhaps I’d make this into a pillow, but when I took it out of the hoop it sort of poofed up! It reminded me of the top of a stool. 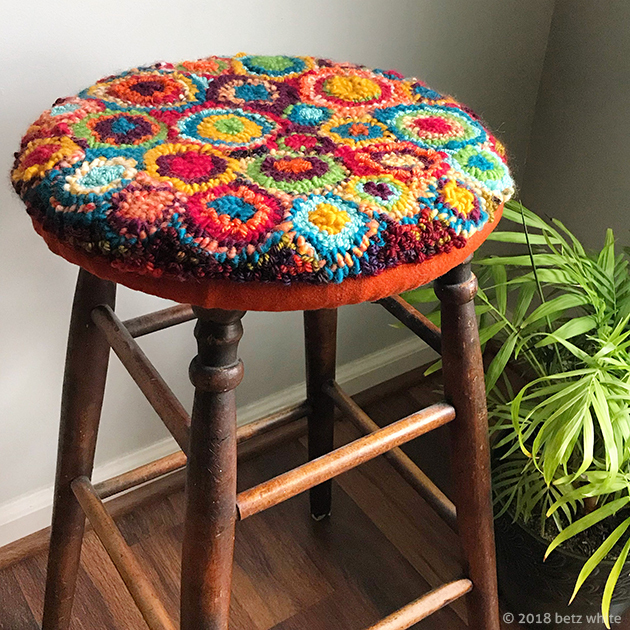 I realized that I had the perfect stool to cover! The punch needled area was the right size for the top of the stool, but I knew I wanted it to be more secure. So I found some wool fabric in a coordinating color to make a casing around the edge. I sewed it to the monks cloth as close as possible to the loops, using the zipper foot on my machine. Then I laced a drawcord through the casing to cinch it up under the edge of the seat. It attaches kind of like the cover of an ironing board. 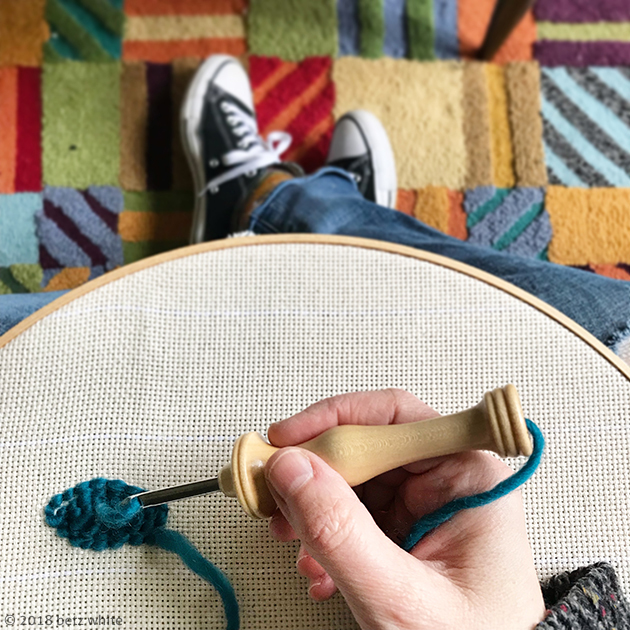 If you’re interested in learning more about using a punch needle, I suggest checking out the Oxford Company website! Amy Oxford has lots of youtube videos to help you get started. 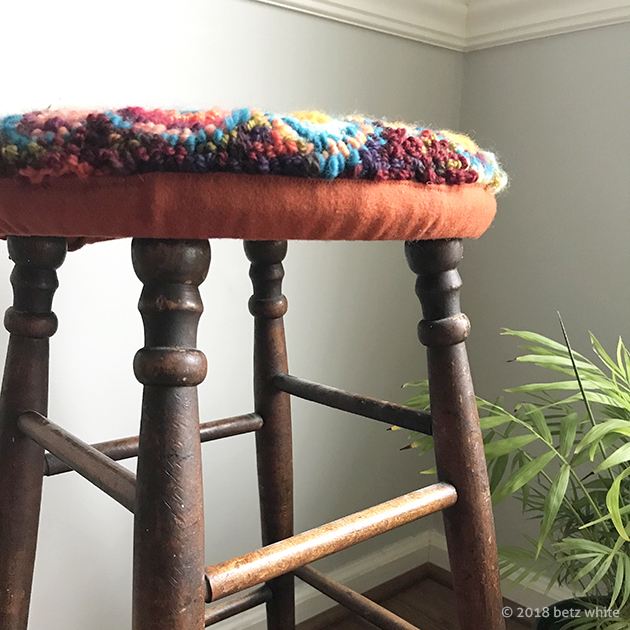 It’s neat that your kitchen stool has such wonderful memories. Your punch needle top looks fantastic. I used to do punch needle back in the 70s. I’m glad to see it’s getting popular again because it’s so fun.